When shopping for lights, electric decorations, and extension cords, it’s recommended that you purchase only the ones that are UL-listed. If you’re planning to decorate outdoors, make sure that you use lights and decorations that are rated for outdoor use. Putting indoor-only products outside in the weather can result in electric shock and fire hazards. If you’re still in doubt as to whether light strings are rated for indoor or outdoor use, just check the color-coded UL mark on the product’s package. A green holographic UL mark says, “indoors only, please,” while a red one indicates that the product is safe for both indoor and outdoor use. Whether they’re brand-new out of the box or seasoned veterans from holidays past, before you put them up, inspect all lights, electric decorations, and extension cords for signs of damage to wire insulation, plugs, and bulbs. If the damage can be repaired, such as broken bulbs replaced, then do not use the item until the repair has been made. If cords and plugs are damaged, simply discard it and replace the decoration. Always unplug your lights before changing any bulbs, replacing fuses, or making any other repairs. If you do need to replace a bulb in a string of Christmas lights, make sure that the wattage rating of the replacement bulb you’re using matches that of the light strand. Using a bulb with too high a wattage can cause the light string to overheat, creating a fire hazard. When hanging Christmas lights outdoors, you should reduce your risk of electric shock by passing up metal ladders in favor of ladders made of non-conductive materials like wood or fiberglass-reinforced plastic. Only use lights and decorations in accordance with manufacturer’s’ instructions! Be careful not to overload extension cords. Be sure to only connect up to 3 strands of lights together end to end, this will ensure the safety of the connection and prevent any fires. Before you start plugging in, find out the wattage rating of your extension cord, as well as the power requirements of any lights or decorations you’re planning to plug into it. A wattage rating is the amount of electricity that an extension cord is built to carry, and if the combined power requirements, or “pull” of your lights and decorations, exceed that rating, overheating and fire can occur. Every so often, check Christmas light wires to make sure that they’re not warm to the touch. Always turn off all Christmas lights and decorations before going to bed or leaving the house. In Summary, sometimes it’s to leave the outdoor Christmas lights to the professions. Here at Landmark Design Company, we specialize in professional Christmas light installation that not only meets the highest industry’s safety standards but also is sure to “wow” you during the holidays. 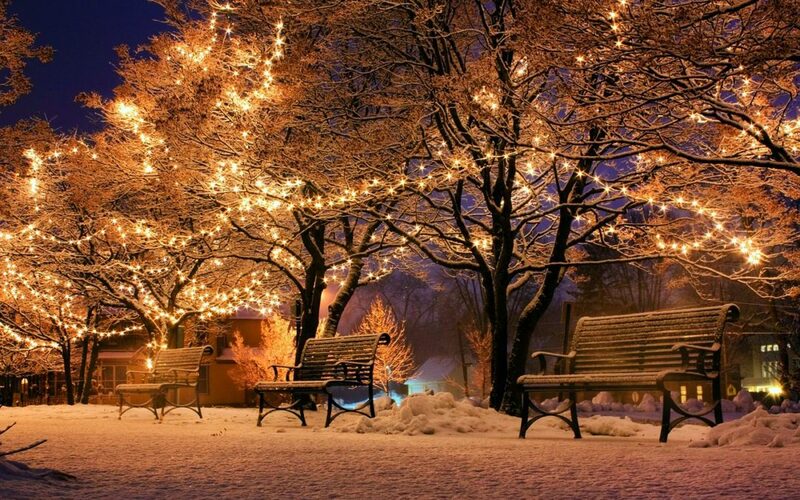 Contact us today to schedule your appointment for Christmas light installation!